A drug called palbociclib, used in combination with standard treatment, improved survival for women with hormone receptor-positive metastatic breast cancer, according to the results of a phase III clinical trial published in the New England Journal of Medicine. Massimo Cristofanilli, MD, professor of Medicine in the Division of Hematology and Oncology and associate director for Translational Research at the Robert H. Lurie Comprehensive Cancer Center of Northwestern University, was the corresponding author of the paper published in the New England Journal of Medicine. “The results of the study show that it is possible to improve and prolong the life of patients with hormone receptor-positive metastatic breast cancer. 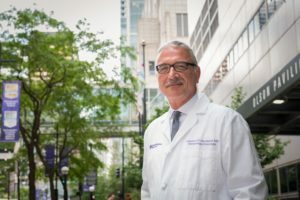 We now have solid data to suggest that this treatment should be the new standard of care,” said principal investigator Massimo Cristofanilli, MD, professor of Medicine in the Division of Hematology and Oncology and associate director for Translational Research at the Robert H. Lurie Comprehensive Cancer Center of Northwestern University. Palbociclib is a novel oral drug that inhibits cyclin-dependent kinase (CDK) 4/6 — enzymes important in cell division. The current study, published in the New England Journal of Medicine, reported overall survival outcomes for participants in PALOMA-3. It is the first to report overall survival data from a phase III trial testing a CDK4/6 inhibitor in this patient population, according to Cristofanilli. The investigators found that palbociclib led to a clinically meaningful improvement in overall survival; median overall survival was 34.9 months in the palbociclib and fulvestrant group, compared to 28 months in the control group. The benefit was even greater in patients with sensitivity to prior hormone therapy. “Typically, treatments for estrogen-positive metastatic breast cancer delay the progression of cancer but almost never prolong the life of patients. This treatment is the first of its kind to show such an important benefit,” Cristofanilli said. The study results were also presented at the European Society for Medical Oncology (ESMO) 2018 Congress in Munich on October 20. The study was supported by Pfizer, which manufactures the drug.